Metal Powder is the foundation of our process. Our proprietary processes used in reducing metal oxides to the metal powders yield unmatched purity and quality. As powder metallurgy experts, Elmet precisely controls the process to ensure the powder meets our stringent purity requirements. Our pure molybdenum metal powder has an average particle size of 4-5 microns and mesh of minus 250. This powder primarily is used to press ingots that are employed in the manufacture of rod, sheet, plate, and near net shape products. In addition, metal powder is also used in the production of moly coat and various surface coatings. 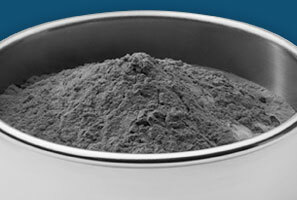 Please visit our Materials page to learn more about our powders.